The 2005 AOSD conference was hosted in Chicago Illinois, in the United States from March 14 – 18. The event’ General Chair was Mira Mezini while the Program Chair was Peri Tarr. The conference was significant for the various revelations and insights on AOSD. Notable among the deliveries was the keynote speech by one of the two keynote speakers, Grady Booch, IBM fellow. His speech caught the audience attention in the way and manner it was presented. 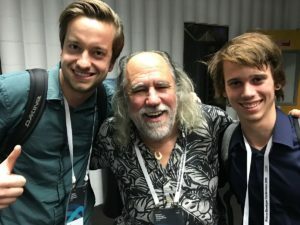 Grady Booch with some fans of his genius. As Grady Booch stepped on stage, the question asked was; “How many lines of code are written each year round?” the answer was about 35 billion each year from about 15 million software developers. In his views, the common trend observed is that things are getting the more complex as years go by. A particular system means different things to different individuals. Simplicity also has different views. Grady Booch points out clearly that in the midst of complexity, ensuring simplicity in an aspect of the system is realized by trading off complexity elsewhere. Grady also established that a program is structured by lots of design decisions from different stakeholders who work to create balance forces hovering around the system. Essential complexity can be mastered but we cannot totally do away with it. It was stressed that if we are not knowledgeable enough to be able to measure complexity, it is equally reasonable to say that we cannot also measure simplicity. It should be stated that a working complex system evolves from a system that is simple and known to have worked. A complex system that is designed from the scratch is seen to never work and that fundamentals will not go out of fashion and style. These were the insightful notes made by Grady Booch to enlighten the audience on trends and developments in software development.